Indian Army has issued a notification for the recruitment of unmarried Male candidates for grant of Permanent Commission in the Army after four years of Basic Military Training and Technical Training under 37th 10+2 Technical Entry Scheme Course. Age: Candidates age must not be below 16½ years & above 19½ years as on the first day of the month in which the course is commencing i.e. the candidate should not be born before 01-01-1998 & not after 01-01-2001 (both days inclusive). Educational Qualification: Candidates should have passed 10+2 Examination or its equivalent with a minimum aggregate of 70% marks in Physics, Chemistry & Mathematics from recognized education boards. 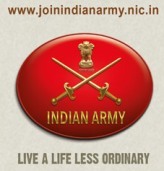 Advertisement Details: Pl check website www.joinindianarmy.nic.in .